We’re open Monday to Friday from 8:30am to 4:30pm. Momentum Sports & Rehabilitation Services offers expert assessment and treatment of injuries and conditions to optimise fitness and function. We treat and manage a wide range of conditions including post-surgical rehabilitation, sports and workplace injuries, and chronic pain. We also offer functional rehabilitation for long-term conditions such as spinal injury, amputation, neurological damage, and long-term functional impairments. With a strong emphasis on education and ongoing injury management, our holistic programs are tailored to your individual needs. We invite you to meet with our team and take a leading role in your rehabilitation to achieve your health and fitness goals. Our clinic in Bruce, Canberra, is purpose-built for the unique needs of our clients. We offer disability-friendly access and facilities, as well as free onsite parking. We provide a relaxed, friendly atmosphere with private rooms and rehabilitation area. 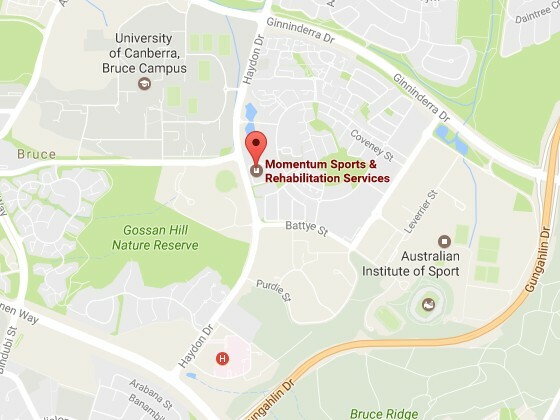 We are located centrally between the Calvary Hospital, the Australian Institute of Sport and the University of Canberra. Prosthetics, orthotics and physiotherapy services in Canberra and the ACT.